In an open culture, we share: we share our successes, our failures, and the respective paths we took to achieve both. The end point is incidental to the act: it’s the mindset of sharing that helps us to be more open, accountable, adaptable and agile. It’s the act of sharing that helps us to be wise. Does your organisation have a culture of sharing, or is knowledge still used as a mechanism of control? In the Social Age, reputation is forged in our communities, founded upon reputation built over time. it’s consistency of action and reaction that counts. Leaders who are humble, who share wisely and act consistently can develop stronger social authority and, hence, be more effective in the communities that help us to be agile. Our time, our knowledge, our capability, our wisdom, our communities, our expertise. It’s not just about curating content and sharing it (although that is a key skill for social leaders), but also about sharing our capacity. It’s about helping out. A sharing culture is one where the default position is to be open, to be curious. It’s permissive of diversity and difference and welcomes permission to experiment. 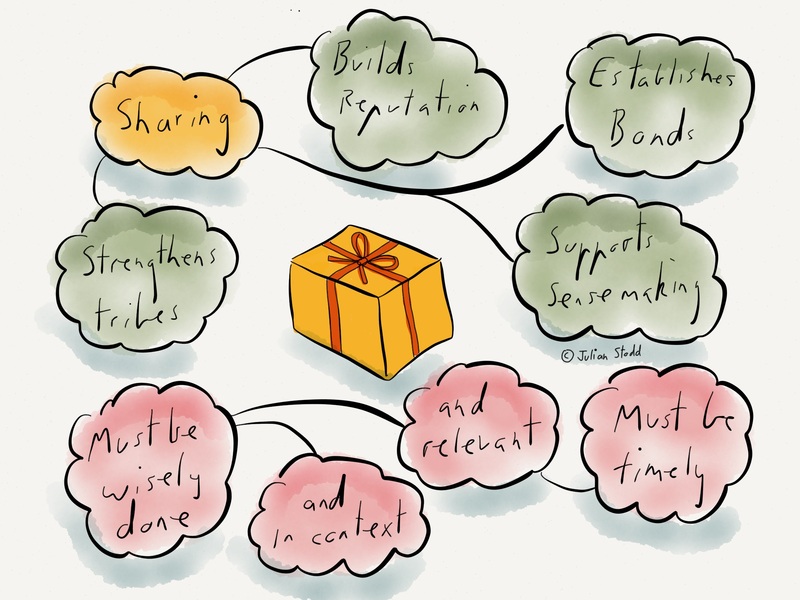 Sharing is not about reciprocity: it’s about clarity of purpose and openness of intent. If we share wisely, we build bonds, we build reputation, we strengthen our tribe, and strong tribes are ‘sense making‘, they help us fathom our path through the Social Age. A sharing culture is not the preserve of New Age cooperatives or collectives: it should be front and centre of any healthy and competitive organisation. Share with your friends, share with your competitors. If they are looking to you to learn, it just shows that you’re doing something right. But sharing is not about volume: i use the word ‘wisely’ intentionally. It’s about adding context to what we share, about ensuring it’s relevant and timely. Be it our support or our resources, it’s about sharing the right things at the right time. Knowing when to offer and being open to being asked. Reflect on the culture in your own organisation: does it welcome sharing, is it permissive of sharing? Or do you still use knowledge as a mechanism of control? This entry was posted in Culture, Sharing and tagged Competition, Culture, Generosity, open culture, Share, Sharing, Social Age, Wisdom. Bookmark the permalink.